Handel’s statement Thursday morning says her careful review of the vote count shows she narrowly lost to Democract Lucy McBath. McBath’s margin of victory was narrow enough for Handel to have requested a recount. The Associated Press declared McBath the winner Thursday after Handel conceded. 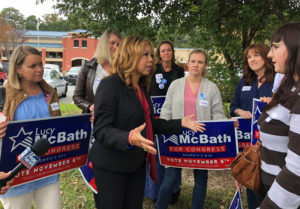 McBath won in the 6th district — the seat former House Speaker Newt Gingrich held when he led a GOP congressional takeover in mid-1990s — by campaigning as a “mother on a mission” to strengthen gun control laws. Woodall’s campaign manager, Derick Corbett, said the campaign had no immediate comment Wednesday.